This unit builds on Unit 7, which introduced the npm registry and npm CLI. In this unit, learn about managing dependencies with the package.json file. You’ll also learn about the evolution of your Node applications–in other words, the cycle of writing an application, releasing it, and maintaining it. Node.js Learning Path This tutorial is part of the Node.js Learning Path. The units build on each other, so check out Learn Node.js, Unit 1: Overview of Node.js Learning Path to start at the beginning. While developers tend to have the first three activities down, the last one is more or less out of our control. This is especially serious in Node due to the sheer number of dependencies to be managed. That’s why it’s key that you understand package.json and its role in maintaining and evolving your applications. package.json is a file that contains basic information like package name and version number, as well as more complex metadata. npm requires the package.json file to manage projects, and every project submitted to the npm registry must have one. If you want to create a successful Node project, you need to know how to create a package.json file. Let’s look closer at the elements of this file. package.json can contain many more fields than just these two, but let’s start with what’s required. I introduce the other fields soon. In addition to elements like name and version, package.json contains more complex metadata. This metadata helps npm manage your dependencies, run scripts to start the application (as you saw in Unit 6, run unit tests, and more. description: The human readable description, which comes up in npm search if you publish a package to the npm registry. license: The package’s license identifier (in Software Package Data Exchange (SPDX) format)– available licenses include Apache2.0, MIT, or ISC (the default), to name a few. author: The developer (more specifically, the developer’s name and email address). scripts: Scripts that run at various points in the package’s lifecycle (for example, start and test). dependencies: Any other Node.js packages the package depends on (lots more about this later). These are just a few of the metadata elements used for Node. You can read about all of the metadata available in package.json in the Node documentation. One of Node’s greatest strengths is the npm ecosystem, and sharing code is key to the culture of Node. Using third-party software in your programs can also introduce complexity to your projects. Knowing how to wrangle package.json will save you countless sleepless nights managing bugs, software updates, and other issues. If you run npm init from the command line, npm will interview you about your new package. It will ask you a series of questions. For each of those questions there is a default, which I’ve summarized in the table below. test command "echo \"Error: no test specified\" && exit 1"
If you haven’t already done it, open a terminal window or command prompt and navigate to an empty directory. All the source code for this unit is on GitHub, but I want you to build this example from scratch. That way you’ll own it, and you’ll understand it more deeply. Relying on third-party software is part of Node-based development, and most Node applications have numerous dependencies. As software evolves, these dependencies can cause quite a mess for Node.js applications. Once you’ve installed dependencies they also have to be managed. In this section, I show you how to manage all the dependencies. Feel free to replace your name as the author in your local copy. There are two ways to add a new package as a dependency to your Node project. Let’s look at both options below. npm WARN Unit-8@1.0.0 No repository field. Look at package.json and you’ll notice two differences from before you installed makoto-logger. Second, notice that npm created the node_modules directory and placed the newly installed dependency there. Another way to install a new package is to specify it as a dependency in package.json, then run npm install with no arguments. The new dependency and all of its dependencies will be installed. You may wonder what the caret (^) just before each version numbers means. That’s Semantic Versioning (SemVer) syntax, which we’ll look at next. Semantic Versioning (or SemVer) is a formal way to specify version numbers. It was created by Tom Preston-Warner, one of the cofounders of GitHub. As of this writing the latest SemVer specification is 2.0.0. Major is used for a new public API that breaks (is not backward-compatible with) a previous version (for Major > 0, that is). Minor is used for new features that are backward-compatible (or non-breaking) only with the current major version. Patch is used for a bug fix that is non-breaking. The SemVer spec also has extensions for creating pre-release labels, but I won’t cover those here. 1.0.0 is always the first release of the public API. 1.1.1 indicates the release is the first patch, of the first feature release after the first release of the public API. 2.0.4 indicates the fourth patch after the release of the first breaking change (that is from 1.x to 2.0.0). Don’t skip integers (to go from, say, 1.2.4 to 1.2.6, skipping 1.2.5); always increment them. Numbers always increase within any subordinate version component, and reset to zero when their superior changes. For example, a feature release of version 1.2.3 becomes 1.3.0 where Patch resets to zero. A breaking change from 2.9.11 becomes 3.0.0 and resets both of the subordinate Minor and Patch numbers. Dependencies change, and if you don’t tend to them those changes can break your code. SemVer’s version numbers gives a package author a way to qualitatively declare the impact of a given change relative to the previous version. As a package consumer, it also gives you a way to specify how much change you are willing to tolerate for a given dependency. As a package producer, you can follow the SemVer guidelines to easily inform package consumers of how much a dependency has changed from one release to the next. As a package consumer, you can follow the SemVer guidelines to enable your package manager (npm, yarn, etc.) to automatically handle those upgrades. Used properly, SemVer will save you from having to read hundreds of release notes, just to figure out if your code is going to break when you do an upgrade. When you have hundreds or thousands of dependencies, tool support for SemVer really matters. So let’s see how to use SemVer to tell your package manager how much version tolerance you are willing to accept on a package-by-package basis. The syntax can get complicated, depending on what you’re trying to tell npm to do. This course limits examples to the syntax you’re most likely to use. Use this command when you don’t want npm to automatically upgrade foo-a. This tells npm: “For package bar-a any approximate release from 2.1.4 up to the next feature release (which would be 2.2.0) is acceptable.” In other words, 2.1.5 would be fine (as would 2.1.6, 2,1,7, and so on), but 2.2.0 would not. Use this command when you’re willing to accept bug fixes (patches) but don’t want npm to automatically upgrade to new feature releases. In this case, npm would automatically update baz-a to, say, 1.2.6 or 1.3.0, but not to 2.0.0. 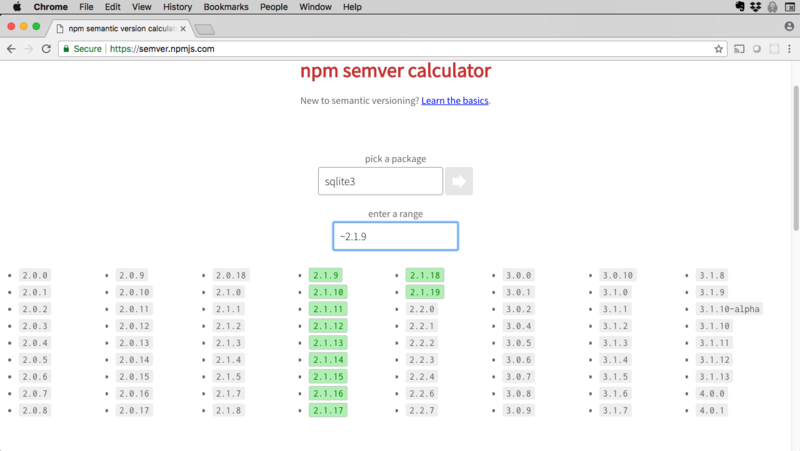 You can use the npm semver calculator to get the exact rule you need for a given dependency. All you have to do is choose a package, then input a SemVer rule. The tool will show you which versions of that package match the given rule. The calculator is also a great way to learn SemVer syntax. Check it out and play around with it. If you’ve worked in Node, you’ve probably noticed the file called package-lock.json. Turns out it’s an important file that solves a dependency-related problem. Let’s take a look. To get at the problem, let’s go back in time to the days before npm release 5. We’ll use sqlite3 as an example. At the time of this writing, the current version is 4.0.1. I publish my package to the npm registry and life is good. Some months later, the sqlite3 team publish a new feature release (4.1.0) that is completely backward compatible with 4.0.1. Around the same time, you decide you want to use my package, so you specify it as a dependency in your package.json. When you run npm install you will get sqlite3 version 4.1.0. So far, so good. The npm shrinkwrap command was an early attempt to do package locking. It suffered from a few drawbacks, but it was a pretty good solution. Most developers agree that package-lock.json is the way to go for package locking, but you should be aware of npm shrinkwrap in case you bump into it. Learn more about npm-shrinkwrap.json here. Now let’s suppose that the way my package uses sqlite3 conflicts with the new feature and creates a bug (to be clear, this is my fault, not sqlite3’s). My code breaks, which means your code breaks. That’s not good. The problem is this: based on the loose specification of the dependent version of sqlite3, the structure of your node_modules directory will be different following npm install than it was for me when I created my package. When two people can run npm install and get different results, we call those results non-deterministic, meaning that you can’t always determine what a given node_modules directory will look like. The non-determinism in this scenario is caused by the loose specification of dependent versions. What’s needed is a way to lock the specifications in place so that they are not loose. package-lock.json was introduced in npm version 5 for this purpose. Now, whenever you run npm install, the exact version of every dependency is listed in a package-lock.json file, which is automatically generated. The file is used to resolve dependencies and install the correct dependency tree in node_modules. In the case of our example, assuming there are no other dependencies on sqlite3 in your code, and given how I specified the dependency in my package.json when I published the package to the npm registry, you should always be able to determine which version of the package is installed for your project. Learn more about package-lock.json Deterministic installation is a complex topic, and there is more to learn than I could cover here. [Check out the npm documentation for further explanation and examples. We’ve worked through the first few units in this course using “Vanilla Node”, meaning we’ve written all the code ourselves. Now we’re ready to move beyond this restriction, and start incorporating third-party code in our projects. The npm ecosystem provides so much code you can reuse with a quick addition to your package.json and an npm install. I’ll introduce a few of those packages in the next sections, and we’ll use them in upcoming units. Assert-style: For example, assertEqual(actualValue, expectedValue). Behavior-driven development (BDD) style: For example: expect(expectedValue).to.equal(actualValue). Together, Mocha and Chai make a powerful, must-have combination for Node projects. We’ll use Mocha and Chai in Unit 9. Winston is a logging framework with the notion of transports, which are storage devices for logs (such as the console, files, and so forth) with additional community contribs for other transports like MongoDB. I’ll let you be the judge, because we’ll use Winston in Unit 10. Express is arguably the most popular web framework for Node, with millions of downloads per week. It has lots of features you look for in a web framework: it’s fast, offers extensive templating support, has robust, easy-to-use routing, and more. We’ll use Express in Unit 11. MongoDB is one of the most popular NoSQL databases in the world. Mongoose is an object data modeling (ODM) tool for MongoDB. We’ll convert the Shopping List application from Unit 6 to use MongoDB and Mongoose in Unit 12. These are just a few of the most popular packages for Node. Be sure to visit the npm website or npms.io to search for more packages you might want to use in your Node projects. This unit has introduced you to package.json and using it to manage the challenges of software evolution in Node. You’ve seen some of the elements this very important file contains, and you’ve learned how to create a package.json file from scratch. We also looked at Semantic Versioning (SemVer), and I showed you how to use it to denote and manage updates in your Node applications. SemVer automates many aspects of dependency management, but it only works if everyone (package producers and consumers) follows the rules. We also looked at how package-lock.json solves the problem of non-deterministic installation. Finally, you got a first look at some Node packages we’ll work with in upcoming units. These are all packages you should know about, and you’ll get to know them better very soon. We’ll start integrating third-party packages in Unit 9, where you’ll learn all about testing with Mocha and Chai. SemVer was created to deal with the complexity of package dependency resolution in an automated fashion, when there are hundreds of thousands of dependencies. The author and repository elements are required in package.json if you plan to publish your package to the npm registry. Which of the following package.json elements are required? Which of the following tells npm to match version 1.2.4 or higher and any compatible version up to version 1.3.0? Which of the following best describes the purpose of package-lock.json for package my-utility? A. Ensures deterministic installation; that is, the same node_modules tree for any installation of my-utility. B. Ensures that the node_modules directory cannot be deleted during a failed unit test. C. Ensures that a change to package-lock.json is immediately reflected in package.json so the build does not fail. D. Ensures the project is consistent across hardware architectures where packages tend to float freely. If the current release is 2.3.0, the next Patch release number will be _. If the current release is 3.10.2, the next Minor release number will be _. If the current release is 1.0.0, the next Major release number will be _. A. Bug fixes, compatible with the previous release. Release type is _ and the version number is _. B. New features, not compatible with the previous release. Release type is _ and the version number is _.
C. New feature, compatible with the previous release. Release type is _ and the version number is _.
D. Breaking change to the public API. Release type is _ and the version number is _.
E. Bug fix, not compatible with the previous release. Release type is _ and the version number is _.
F. Addition to the public API, compatible with the previous release. Release type is _ and the version number is _. If the current release of package-a is 1.2.3, the SemVer syntax to indicate “starting with 1.2.3, any Patch and Minor release up to release 2.0.0 is acceptable” would be: _. If the current release of package-a is 1.2.3, the SemVer syntax to indicate “any 1.2.x Patch release up to release 1.3.0 is acceptable” would be: _. If the current release of package-a is 1.2.3, the SemVer syntax to indicate “starting with 1.2.3, any 1.2.x Patch release up to release 1.3.0 is acceptable” would be: _. If the current release of package-a is 1.2.3, the SemVer syntax to indicate “only release 1.2.3 is acceptable” would be: _. If the current release of package-a is 1.2.3, the SemVer syntax to indicate “any release including and above 1.2.3 is acceptable” would be: _. Answer: True: When a package changes, the package author changes the version number in accordance with SemVer guidelines. This enables package management tools like npm to automatically resolve the resulting dependency trees. Answer: False: Only the name and version elements are required, regardless of whether you publish your package to the npm registry or not. However, you are strongly encouraged to provide values for as many of the package.json elements as you can. Answer: B: Of the elements listed, only name is required. The other required element is version, which is not listed. Answer: D: Any minor release at or above 1.2.4 up to 1.3.0 will match this SemVer rule. Answer: A: A deterministic install is one where the node_modules tree is consistent for anyone who installs my-utility, regardless of dependency churn since my-package was published. JSON ECMA 404 Specification Read about the JSON Data Interchange Syntax. Semantic Versioning 2.0.0 specification Learn more about the Semantic Versioning 2.0.0 specification. 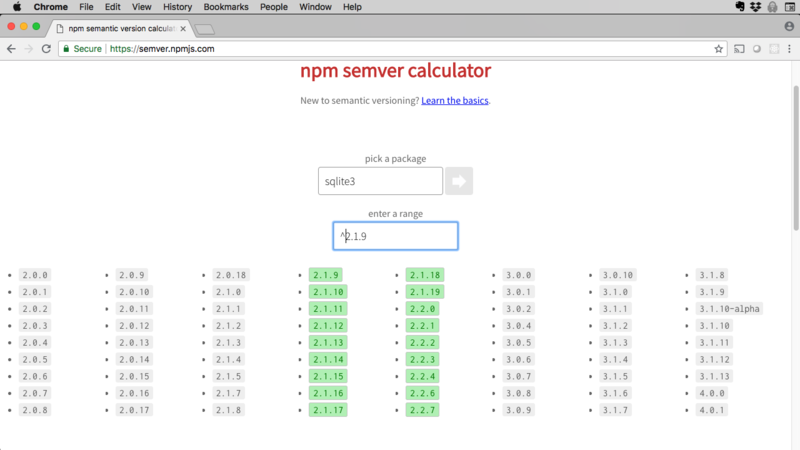 npmjs.com SemVer Calculator Use the npm semantic version calculator. Package locks Get an explanation of npm lockfiles. Winston Winston is a logger for just about everything. Express Fast, unopinionated, minimalist web framework for Node. MongoDB Check out the official MongoDB driver for Node.js. Mongoose Mongoose is a MongoDB object modeling tool designed to work in an asynchronous environment.